Nevertheless, I brought the Opera Libretto with me to read under my umbrella at the beach. Then something incredible happened.. and I am starting to think it is me!! In Liguria, to rent an umbrella for the month of July and August, you must reserve at the Bagni a full year in advance. But If you want the first row, you need to wait until a front row client passes on to a “better life” (Megan Barnett did u see my euphemism?). For the last 3 years due to personal reasons, I did not go to Liguria, so I lost my spot. In June, I found an umbrella for ten days in a “Local VIP” beach, (let’s not mention the price!! ), but in August, when I arrived, I knew from the start that it was all sold out. After I visited 4 or 5 Bagni near my house, and they all said, “I am sorry dear,” I realized this was my big chance to change completely, and move to a beach on the other side of town: a place less groomed and polished, but in a very beautiful spot, and where the surfers hang out. Honestly, looking around, it was not my first choice, because it was too close to the bar, but nevertheless it was a first row! “I’ll take it! We will start tomorrow,” I said. The following day I had things to do in town, so I did not go to the beach. I sent my husband with babygirl. He came home very satisfied because until 2 pm the umbrellas on our left were empty, and at 2 pm the couple sitting on our right went for lunch and didn’t come back until 6 pm. So when one umbrella was full the others were empty and viceversa. What can be better than that, on an Italian private beach in August? Nothing! The following day, I went to the beach. I made friend with the couple on our right: two young professors from Dolo, near Venice; then we went for lunch at the bar that was very good, and there I met another former French professor, so I felt right at home. I was very happy with my change. Then the people on our left arrived. They had reserved 5 lettini and some chairs. They were so many: women and men with kids and a grandmother in tow. They were not couples, they had kids and lots of stuff. But they were not husbands and wives. Some stayed for 2 hours, then left, and others arrived. They were not related to the women either. The only thing they had in common was their look; all the men had a beard and dark hair; they were not thin and had solid muscular bodies with round bellies. They also had strange tattoos with lots of words and swords. The women too had dark long hair. They were very thin, tan and good looking. Each wore several silver bracelets on her wrists, and a showy necklace, except for the grand-mother. They all had “qualcosa di selvaggio” and sensual, but I couldn’t pick out what it was. The way they were standing with their hands on their hips, their necks straight, and their chins up recalled a pride and an “attitude” that some people have toward life and fate. He was surprised that I talked to him. He was embarrassed in front of me because the little boy didn’t want to sleep. I think he felt judged by me, as if he was not good enough in obtaining what he wanted from a child. He then answered that usually his boy slept fine on the beach, but after my words he stopped insisting and let the boy go back to the water. These are Carmen’s people!” I’ve been sitting next to Carmen’s people for a week! And never, never before the Bizet’ s music made more sense!! 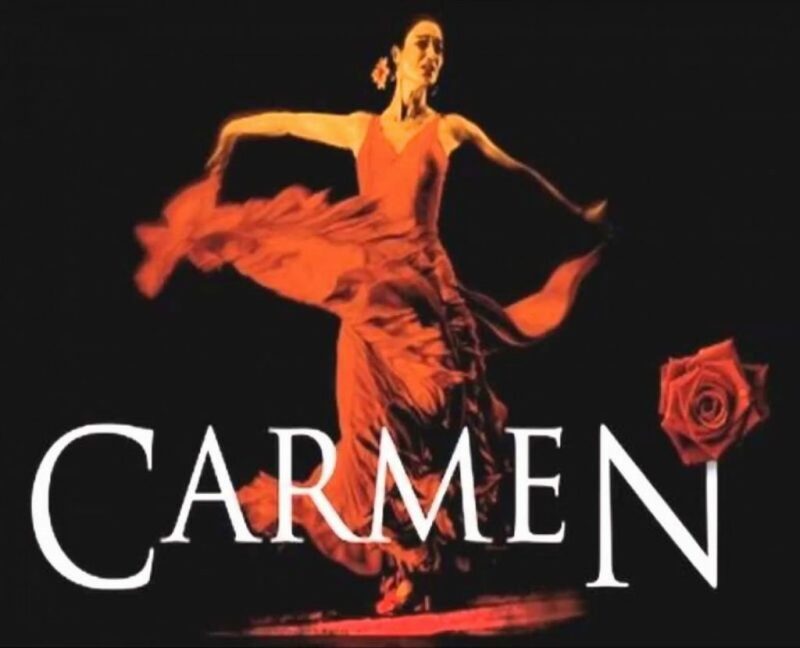 Carmen is a masterpiece! It was a sign: I MUST GO TO THE ARENA WHEN I COME BACK! Today I wanted to strike up a conversation, but nothing happened. Later in the day I sat next to the French Professor and we started to talk to another person, a Latin professor who is in love with Opera. It was easy, but now I need to find something to say to my other neighbors that will start a conversation. Should I ask them about Carmen? Tomorrow I will try again… Now I am so curious! !